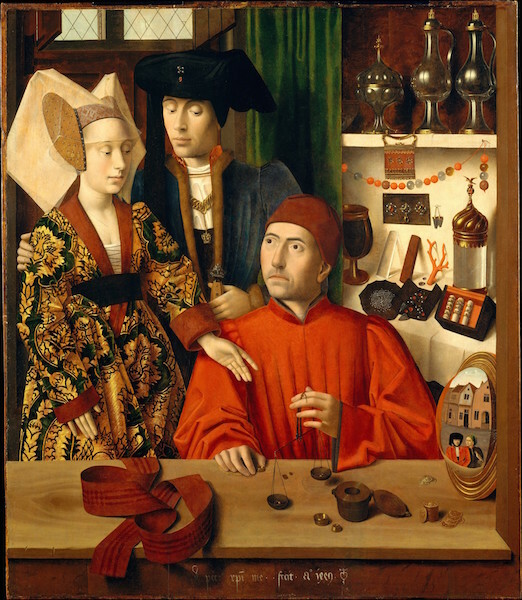 Like many Northern Renaissance paintings, Petrus Christus’ Goldsmith in his Shop reveals its complexities to the viewer over time. At first, one sees a group of three people inside a room filled with trinkets. The two standing figures—a male and a female in dressed in rich, expensive-looking clothing—appear to be a couple, as the man has his arm wrapped around the back of the woman. This woman gestures with her left hand towards the seated man, who, clad in a plain, red garment with a matching hat, looks up at the woman. 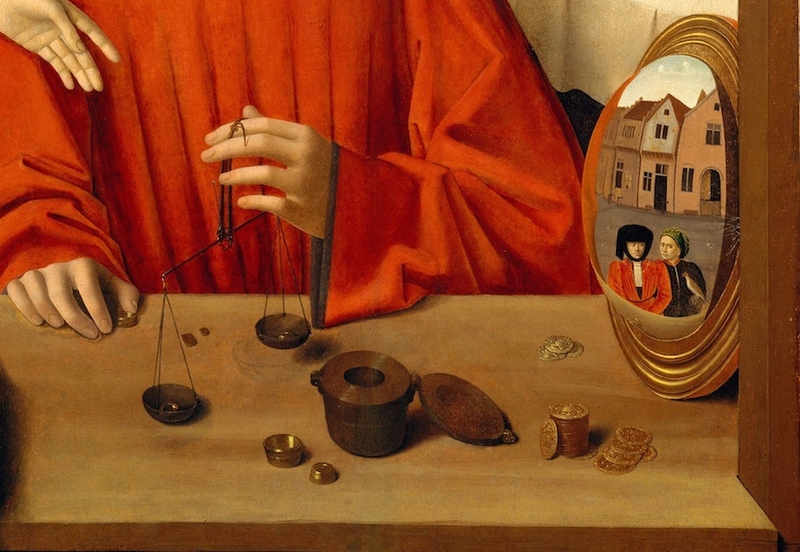 In his left hand, he holds a small balance which supports a gold ring (fans of northern art will recognize this as a small scale—much like the one that appears in Vermeer’s much later Woman Weighing Gold from 1662-1663). In fact, the figures are inside a gold shop, and the man is a goldsmith. The baubles on display—objects made from precious metal, stones, glass, and coral—are his wares, and the standing couple is probably about to make a purchase. However, there is much more to this story. The smith appears to be seated at a work desk, but in fact, the front of the desk is visible, and a length of fabric hangs over it, into our space. Most importantly, a convex mirror resting on the smith’s desk (in the lower right hand corner of the painting) reveals a cityscape. What we see is not a mere desk however. It is, in fact, the front of the smith’s shop, which opens on a street in Bruges (in present-day Belgium, and the city where Christus lived and worked). The two young men captured in the mirror hold a falcon and approach the smith’s shop. The mirror situates us, the viewer, on the street in Bruges with that couple, looking into the smith’s shop at the artisan and the rich patrons behind him. Although genre scenes, or images of every day life, became popular in the North later (“the North” meaning all of the countries above Italy), Christus’ creation of illusionistic and complex space implies that the painting also carries a complex meaning. Since the painting is signed and dated by the artist in white paint in the center foreground, it can firmly be placed in the year 1449. This is the year that King James II of Scotland married Mary of Guelders. The duke of Burgundy, Phillip the Good, who was also a renowned patron of the arts in Bruges, commissioned the goldsmith Willem van Bleuten to make the couple a gift for their wedding. 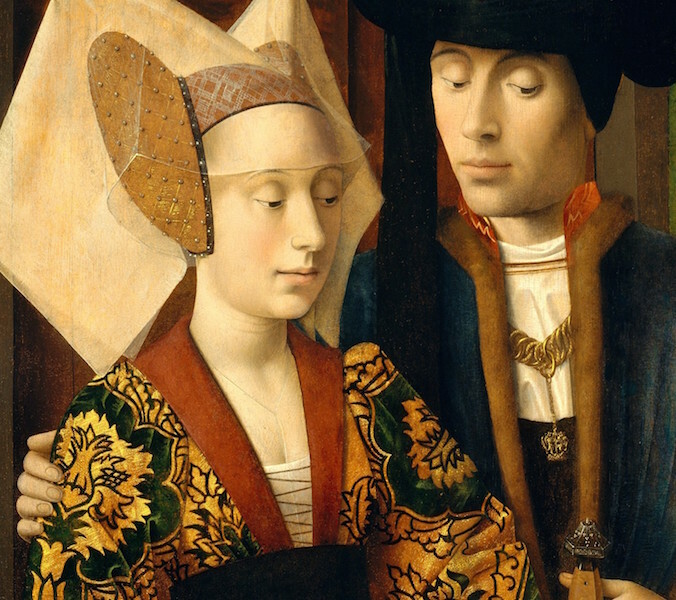 Thus, the painting is believed to depict van Bleuten as he is about to give the royal couple a gift of golden rings, made for their marriage. This interpretation also explains the very expensive brocaded and bejeweled clothes—well out of the budget of the average man—worn by the standing couple. The piece of fabric on the desk is believed to be a wedding girdle (belt), and also supports this interpretation. The two men in the convex mirror may not only be a device used to demonstrate the artist’s virtuoso skill in this tour de force of illusionistic painting. The falcon held by the men is a symbol of greed and pride. Since the scale in the hand of the goldsmith, along with the illusions to marriage and purity, represent perfection and balance, the presence of the two figures with their ill-associated bird creates a contrast between the perfect world of the royals and the imperfect world of the viewer. The royal couple is morally superior to the common man. Petrus Christus’ artistic concerns are typical of painters of his time. The minute detail of the trinkets in the shop, as well as the luminosity of the painting, are only possible because of the use of oil paint, which was not common in Italy until many years later (indeed, the technique is commonly believed to have come to Italy from the North). 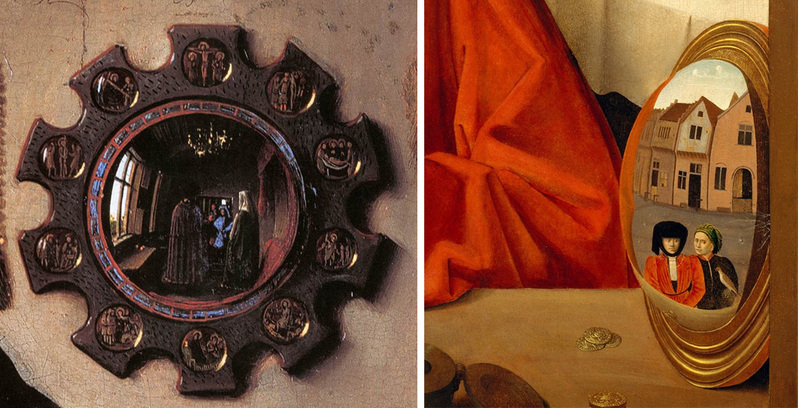 The use of convex mirrors was a device exploited by northern painters, such as in Jan van Eyck’s Arnolfini Portrait (1434)—another oil on oak panel painting. In that painting, a convex mirror hanging in the back of the room reflects the artist himself, whose self-portrait con be discerned in the glass. In Christus’s painting, the round surfaces of the jewels and goblets echo the convex mirror, and the white highlights that are used to create both light and volume betray an interest in still-life painting which would come to dominate northern painting hundreds of years later. Although northern art of this period is often compared to Italian art (and often unfavorably at that), paintings such as Petrus Christus’ Goldsmith in his Shop demonstrate that, although the concerns of the northern artist were different, they were no less talented, their paintings no less beautiful and complex. Indeed, northern paintings from this period (by Petrus Christus himself, along with his contemporaries Jan van Eyck and Hans Memling) were often bought by Italians and made their way into Italy and helped shape the style of the Italian High Renaissance, as well as the Mannerist period that followed. Still, these paintings deserve to be appreciated in their own right as examples of the rapid artistic changes that occurred in the early 1400s, as the world was on the precipice of great political, historic, and cultural revolutions that would end the Middle Ages and bring us into the Modern World. Cite this page as: Christine Zappella, "Petrus Christus, A Goldsmith in his Shop," in Smarthistory, November 28, 2015, accessed April 20, 2019, https://smarthistory.org/petrus-christus-a-goldsmith-in-his-shop/.